← Sunday at Pender ~ WOW! 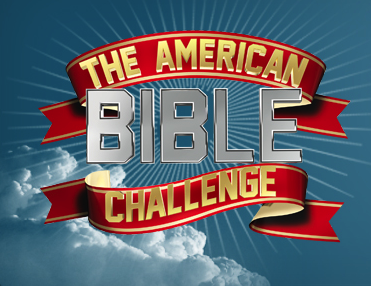 The American Bible Challenge recently returned to Thursday nights on the Game Show Network. Check out this “Bible Bite” trivia question we created for the show. And be sure to catch The American Bible Challenge on Thursday nights at 8/7c! If the entertainment business is any indication, interest in the Bible remains strong. There’s the record-breaking History Channel miniseries The Bible. Then there was the Son of God movie. And the Noah film. Now another TV show is taking its inspiration from the Bible. But this time, it’s a game show. The American Bible Challenge kicked off its third season on the Game Show Network last month. The biblically-themed trivia show became the network’s highest viewed program of all time when it premiered in 2012, drawing more than two million viewers. Hosted by comedian Jeff Foxworthy and Grammy Award-winning musician Kirk Franklin, The American Bible Challenge is a “fun, spirited game show that celebrates the Bible, its teachings, relevance and place in American culture.” Contestants answer questions about the Bible, competing to win $20,000 for charity. Be sure to catch The American Bible Challenge Thursdays at 8/7c on the Game Show Network, carried throughout the US and Canada. For more info on where to watch, visit The American Bible Challenge website.